I had a dollhouse when I was a young girl, growing up in a house built in 1858. I am no longer young (middle aged), but I still remember the many happy hours I would spend rearranging my dollhouse furniture and decorating the dollhouse for various holidays - like Christmas or perhaps Easter. Never Halloween. I would spend hours in my bedroom reading books by complicated authors like Henrik Ibsen, Mary Shelly, Robert Louis Stevenson, Louisa May Alcott, or other writers from around the 18th or 19th century. I agree 100 percent. Dollhouses are indeed great. As well don't you find Nadia that at any age we can totally fall in love all over again with our dollhouses? 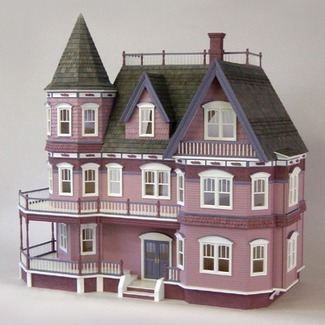 You can get so creative and involved in the process of developing your own dollhouse. For instance you could dream up your version of your house today. Only possibly better than your own living quarters. Maybe even begin to envy the dollhouse you have created. But, lol, never get discouraged by your creation turn it and use it to accomplish better living areas in your home. Every dollhouse we encounter can fuel our own lives if we let it. But that's the thing, we have to let it. And, Thanks so much for your enthusiastic comments. They are much appreciated. Join in and write your own page! It's easy to do. How? Simply click here to return to Make a Comment on our Blog.